Jean Motaung shares her journey in the field of development as the second interviewee of our Women’s Month series, which aims to spotlight the lesser-known women in the sector making an impact where they are, with whatever resources they have. Hi Jean, please tell us a bit about yourself. In the early years of my career, I worked as a Family Planning Advisor in the Department of Health. When the programme ended, we were given the opportunity to do a Diploma in Nursing. I turned down the offer as I was ‘hooked’ on working directly with the needs of families, especially women and youth. I worked in several non-profit organisations like the Institute for Democracy in South Africa (Idasa), Operation Hunger, The Cancer Association of South Africa and Lesedi Educare Association. While at Lesedi Educare, I developed a passion for working with children and their families. 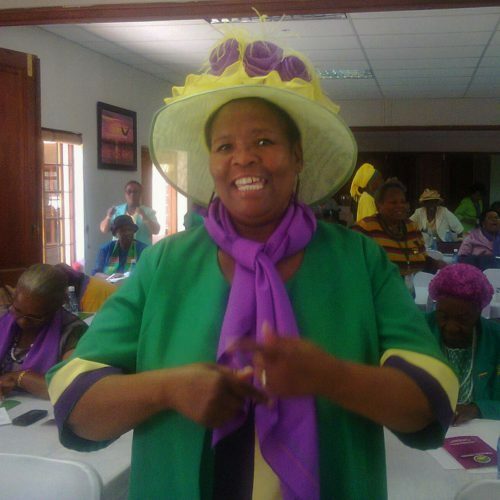 At the same time, I was involved in the National Council of African Women – an organisation involved in the development of communities – where I was the Free State President from 2007 to 2015. In 2012 I established Tshehang Development and Training which is a Resource Training Organisation in Early Childhood Development. The field of ECD is very challenging for an up-and-coming black founder. The field is dominated by white founders who are trusted and supported by most donors. Thanks to donors like DGMT and the National Lottery that trusted in the work I am doing and supported me. They trusted in the impact more than collaboration. I am Managing Director for Tshehang Development and Training. The organisation has a playgroup programme currently supported by Ten Tables (an initiative started by businesspeople in Bloemfontein) through the Free State Care in Action. I’m grateful for the support from all the people involved in Ten Tables! Tshehang Development and Training also has a Training Programme for ECD practitioners and parents. I am presently a Power of Play Facilitator. This is an initiative by the Department of Basic Education, UNICEF, the Lego Foundation and Cotlands. I am inspired by the needs in community: poverty in community, inaccessibility of education and unemployment. As long as I see these, I have a reason to be hands-on in my community. If you could name one thing that you’re proud of about yourself, what would it be? I am proud to be among black women brave enough to be in a Resource Training Organisation in the ECD Field, amidst the challenges. Jean was nominated for being a resilient woman with a heart for community development. It is inspirational that she runs a Playgroup project from her home.